Computer programs, also known as “software”, are a series of instructions that the computer can execute. When you are creating a program, you must specify the instructions that the computer must execute in order to achieve the desired operations. The process of defining the instructions that the computer executes is called programming. The instructions that a computer executes are actually strings of 1’s and 0’s (binary numbers), which represent electronic signals produced by the hardware, inside the computer. Back in the day, when computer revolution was just at the beginning, humans had to understand and program computers directly in this series of 0 and 1, called “machine code”. Nowadays, things have greatly changed, programmers write computer instructions in a more humanly accessible form, called programming languages. 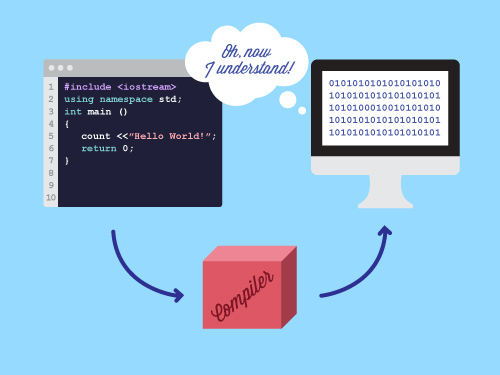 A special program called compiler than transforms these instructions into machine code that can be processed by the microprocessor. There are many programming languages, each with pro’s and con’s, each with different concepts and syntax, however, what I will be teaching is a programming language called C# (read as “See Sharp”). In my opinion, it is the most suitable language for beginners, because its one of the easiest, yet still robust programming language out there. Its syntax is also very similar to C, C++, Java, PHP, etc, which will help you a lot if you ever want to jump to a different (more complex or not) language. C# is part of a larger development platform called “Microsoft .NET”, and it is not the only language in which you can develop software (.NET also offers VB.NET, F#, ASP.NET, C++ managed, etc). The software we will use to write our sample exercises and create our programs is called Visual Studio and it is what programmers call an “IDE” (integrated development environment). It offers everything we need to design, create, write, compile, execute and debug programs using C#. In the next post we will have a look at installing Visual Studio. This entry was posted on Monday, December 19th, 2016 at 06:05 and is filed under Introduction. You can follow any responses to this entry through the RSS 2.0 feed. You can skip to the end and leave a response. Pinging is currently not allowed. Posts (RSS) and Comments (RSS). 513 interogations. 0.432 seconds.